Agua Común-ity seeks to address both access and efficiency of water infrastructure, which in turn gives form to private greenscapes and becomes social class identifiers in the municipality of Manchay in Lima, Perú. Manchay, similar to other informal settlements in Lima, was settled via mass migration and land invasions in the 1980s by people driven from their rural villages and poor urban districts because of political conflict – referred to as the years of terrorism in Perú. It was in the 1980s that the Communist Party of Perú, Sendero Luminoso (Shinig Path), a Maoist rebel organization, began ‘campaigning’ throughout rural villages in the Andes, gaining control of the villages and districts they passed through with violence and intimidation. As a result of this rebellion, indigenous peoples from the central and southern Andes were forced to migrate from the lush green landscape of the mountains to the hot sandy landscape of Manchay. This drastic contrast in change of environment undoubtedly had some level of psychological impact on these people – what was once green, fruitful, and lively outside their home, is now barren and sandy. In the past decade or so, the Manchay settlers have developed local economies and incomes allowing them to construct and sustain their own individual greenscapes outside their homes, reminding them of what was once so familiar. But, as the economy of each family began to vary, so did their access to even the most necessary resources. For example, access to water has now become an indicator of family wealth. Water in the Andes was a common resource due to its natural abundance, but in Manchay, the bottom-line is that there is no water and water has therefore become a commodity serving two purposes, nutritional consumption and plant growth, specifically in that order. Families who are able to satisfy all their nutritional water consumption in excess, can then grow plantings with their surplus of water; those who can only satisfy their families’ nutritional water consumption do not waste water on plants. While plants in the Andes were indicators of nature and the seasons, they are now symbols and indicators of wealth in Manchay. As the economy of each family began to vary, so did their access to even the most necessary resources. For example, access to water has now become an indicator of wealth. To address the social concern, Agua Común-ity first identifies the inefficiencies associated with the existing water infrastructure and distribution in Manchay, the source of the issue. Currently, each family owns a large water storage tank that sits in the hot sun outside or a level above there home. Sedepal, the state-owned water utility service of Perú, delivers water to each individual tank via a large water truck on a weekly basis. Major concerns with this system are three fold: each family must first invest in the purchasing of a water tank and wait for the truck to ascend the steep and sandy terrain of the hillside after stopping at each home requesting water; second, because the water tank is on the exterior of each home it retains an excessive amount of heat throughout the day and becomes a target for water theft at night because of its easy access and minimal security; and lastly, the full potential of water once delivered is never fully maximized through greywater recycling. This proposal to improve the entire system begins with the capital investment of the municipality to provide basic water piping from a proposed water facility located near the top of a section of stairs – stairs that have been funded by local mayors during election years. Each facility is sized to service a section of the settlement from the top to the base of the hillside. The main pipe from the proposed water facility runs parallel to the constructed or planned construction of stairs and the secondary pipes branch horizontally to supply clean water to each home. The facility itself would be filled by water trucks running along one horizontal route instead of multiple roads; this would also reduce the amount of stops along the route. As the municipality becomes formalized and the water infrastructure is slowly implemented, the water facility then becomes an outlet for the state to attach a main Sedepal line that would feed the already-in-place infrastructure and the water trucks would no longer be necessary. Truck drivers could then be trained to operate and maintain the facility and pipes. Once the water is at the scale of the home, the goal is then to maximize its potential through the reclamation and recycling of greywater. After water is used in the home for cooking, washing, and showering, the greywater is directed out of the home and into a sand filter constructed from the now unnecessary water tank. By cutting the top of the tank off, filling the lower third with gravel and final two-thirds with sand and shrubs, greywater can then be drawn by gravity through the filtration system, catching all the larger particles and soap chemicals. Up to this point of the proposed infrastructure, water is still paid for and consumed by the same family, but following the sand filter, water is then drawn downhill by gravity to the neighboring home below. 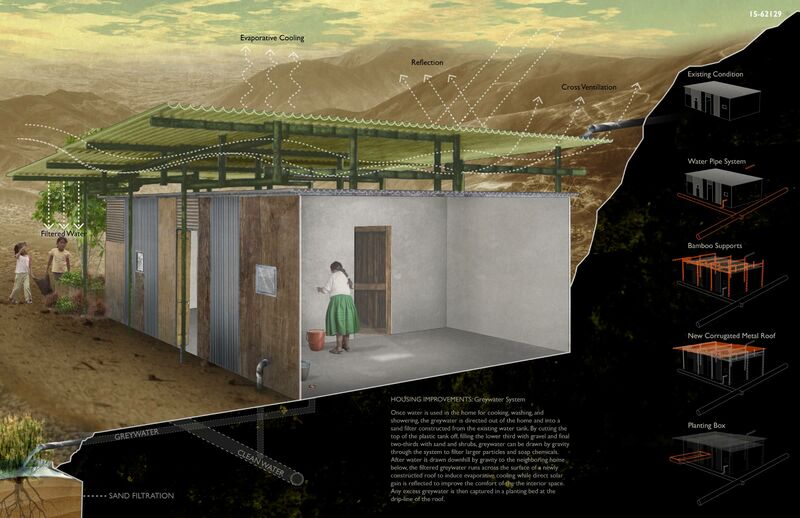 The filtered greywater then runs across the surface of a newly constructed roof, made with familiar building materials – corrugated metal and bamboo. Greywater that runs off the new roof is then captured as water for a planting bed located at the drip-line of the roof. The new roof acts as a secondary building skin that shades and mitigates the direct heat gain currently occurring on the existing roofs, which transfers heat directly into the interior of the home, making it extremely uncomfortable. By proposing a greywater system that is systematically connected within a network, water that begins as a commodity becomes a surplus of another family or beneficiary below. It is through this reclamation of water, that families who are unable to utilize surplus water gain the opportunity to grow plants that are no longer indicators of wealth, but are once again indicators of nature and seasons – an indicator of the Andes, of familiarity, that which remains forever in their memory. By proposing a greywater system that is systematically connected within a network, water that begins as a commodity becomes a surplus. Rather than designing a ‘universal’ housing model, we felt that infrastructure could serve as both a catalyst for growth throughout neighborhoods similar to Manchay, as well as improve the day-to-day life of residents by assuring access to the basic services that allow for healthier living conditions. The fabric of informality varies based on terrain, climate, and material availability. These settlements have innate qualities that emerge during development. Proposing a ‘universal’ housing model would reject every innate quality that defines a settlement, and because of this, agua-común-ity argues for an inclusive infrastructural solution that respects the unique fabric of the community. Han Kwon is a South Korean who came to the U.S. when he was fifteen for an exchange program. He has since traveled back and forth between both countries for the past 13 years. Experiencing two different cultures while growing up, and wanting to explore more, has influenced his perspective on design. He has travelled to various countries including time spent volunteering at a small school in Karim Lamido, Nigeria. This experience brought him to think about the role of a designer in situations of extreme poverty. During a study abroad in Perú, Kwon became interested in the issues of the informal settlements, specifically a community called Manchay. This competition has served as his investigation into a design solution for the Manchay community, and for similar places. Kwon is currently a 5th-year B.Arch student at Iowa State University. Kellen Pacheco was born and raised in Hawaii where multi-culturalism and multi-ethnic diversity influenced his ongoing interest in design and culture. In the past two years, Pacheco has traveled to Perú twice to study informality and to collaborate on two small-scale design-build projects in different peripheral communities of Lima. Since traveling to Perú, he has become interested in how design interventions can influence social, political, and environmental conditions. 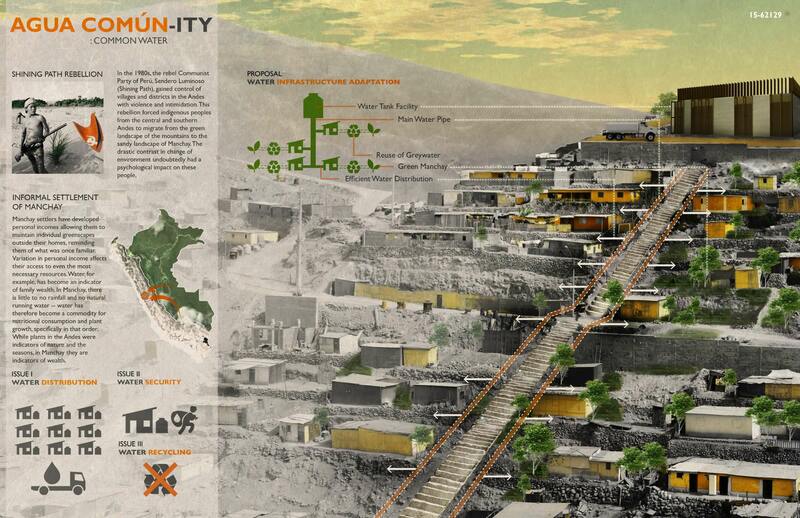 The Dencity competition has been an outlet for him to further investigate the historical and current social context impacting the young community of Manchay, and the opportunity for design to serve the needs of people. Pacheco received a Bachelor of Art in Sculpture from Whitworth University (2012), and is currently a 3rd-year M.Arch student at Iowa State University.